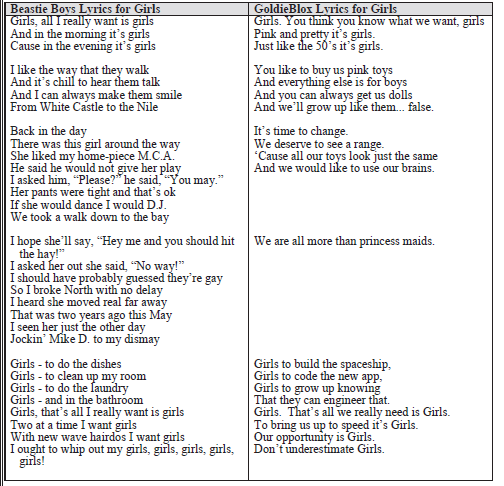 GoldieBlox Parodies the Beastie Boys and “Girls”—Fair Use is Clear, What About Queen’s “Bohemian Rhapsody”? Coverage has exploded this week of a dispute between the Beastie Boys and a company called “GoldieBlox,” over the latter’s use of the song “Girls” in a video encouraging engineering and structural play toys for girls. Despite coverage focusing on whether Goldie Box copied the Beastie Boys’ song (which is undisputed, really, and thus beside the the point in this case), the fair use of the earlier song is clear: the new version is a parody of a leering anthem, intended to subvert inherent sexism into a message of empowerment. Curiously, however, the fair use in another video on the company’s site using the Queen song “Bohemian Rhapsody” seems less clear, but so far unnoticed.